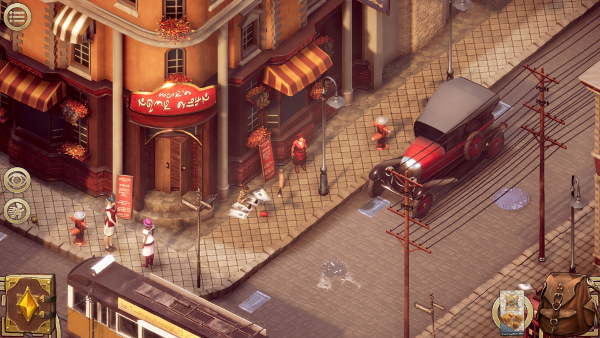 As story-focused indie isometric adventures go, Valiant Game Studio‘s 1920s fantasy-world-based Pendula Swing hits all the right beats. With its occupants navigating a time of societal change tempered by innovation, glamour, and strife, the game invites players to ponder systemic oppression and the role of history, both personal and institutional, in the lives of citizens. All while treating the audience to swing and a landscape transitioning to modernity. Plus, there’s lots of autumnal beauty. I had the fortune to chat with the dev team, diving into their guiding principles and project goals. Erik Meyer: Pendula Swing blends a fantasy universe with a 1920s aesthetic, dropping players into the role of Brialynne Donu Tenúm, a dwarf who goes in search of a stolen axe. I’m always drawn in by the combination of period dress / architecture / music / technology, so can you describe your world-building process and the way you arrived at this specific place and time? PS: Our Creative Director Anna Jenelius has been a fantasy nerd since childhood, but has over the years become increasingly tired of the epic high fantasy setting. It has inherent flaws, such as the perpetual and seldom addressed racism even among “the good guys” (between elves and dwarves, for example). Her interest in history also has made her question why the majority of fantasy stories are set in some version of the Middle Ages, when there are so many interesting eras in history. What would a rokoko elf look like? Or a Roman dwarf? There is another point of attack, too. From the very beginning, what eventually became Pendula Swing was supposed to be a musical game – as in, all the characters were supposed to sing rather than talk. Realizing that the idea carried too many “unknowns”, we quickly abandoned all but the swing music. It made us realize that fantasy races in a 1920s setting was an intriguing concept. The social climate of that era made for fertile soil to plant narrative seeds in – especially since we decided early on that the main issue we wanted to address was prejudice. EM: The game draws clear comparisons to Arcanum: Of Steamworks and Magick Obscura, which places fantasy races in a steampunk setting, but I note PS’s shift in focus (storytelling that moves away from combat, for example). 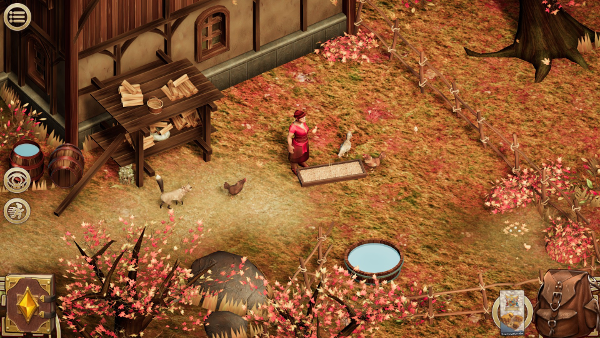 With regard to isometric worlds that players may be familiar with, what have you seen as must-do features, and where do you see PS charting a new course? 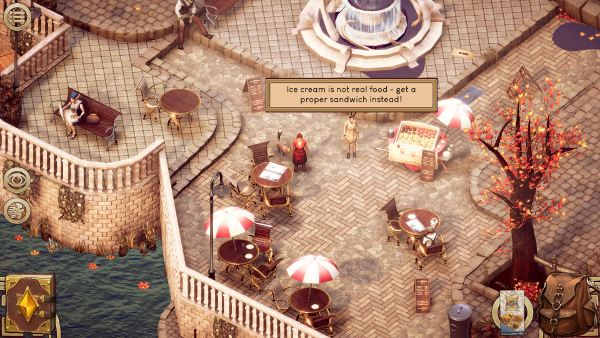 PS: We like to see Pendula Swing as the love child of RPGs such as Baldur’s Gate, point-and-click games, and narrative-focused games such as Telltale’s – borrowing some elements from each and leaving out others. What is front-and-center for us is the story and the world, and we feel like complex systems and combat can sometimes get in the way of the narrative. We want to be part of what we see as a trend in game development today, where players who are not interested in participating in violence can find games to enjoy, too. It opens up new possibilities for us, and allows us to focus on what we as developers feel most interested in and skilled at. Going forward, we want to keep exploring what games can be and what stories we can tell through them. For example, can we build mission-based games that focus on compassion rather than violence? There is nothing wrong with games that use killing as a mechanic – but there are plenty of those already, and we want to push other boundaries. EM: America’s Roaring 20s stands out as unique, possibly because it was immediately followed by The Great Depression as a strong contrast. What kinds of stories and opportunities come with flappers and Jazz that excite you as a developer? PS: The 1920s was an interesting point in time – one of optimism, progress and glamour, but also one marked by the Great War, the mafia, and racism. It provides an interesting foundation for a story that has both a light-hearted side and a more serious one. We’re not too shy to make fun of fantasy tropes or throw in some puns, but we also want the player to see the difficult things some characters are going through. Their stories are echoes of experiences from the physical world, and we use them to encourage reflection on our daily interactions with each other. EM: You’re releasing the game as seven episodes, so let’s chat about that process. What do you see as the positives of episodes as opposed to an alpha/beta process with a gradual integration of additional content? Similarly, how do you feel the episodes changing as you go along? What kinds of adjustments have you made (or do you see yourself making in the future)? PS: The main story of the game was planned very early in the process and is what guides us going forward. We already know what the point of each episode is, which area it is set in, and so on. However, there is so much more to the game than the main storyline. 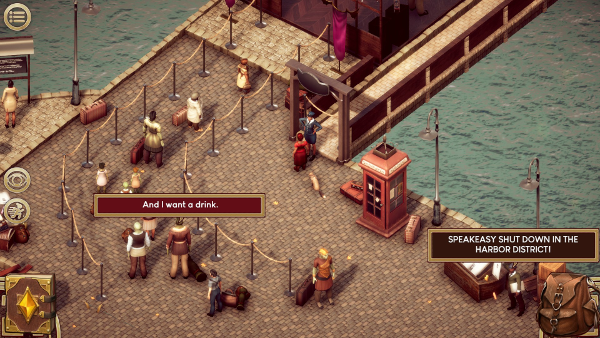 In fact, we want the player to engage with as many characters as possible, as they all have their own view of the world and are a piece of the puzzle that is Pendula Swing. To get to a point where the players feel encouraged to explore, we have been listening to our players and learning what they are most excited about. We have also changed and are planning to change several mechanics based on player input, which is something all players (new as well as returning) can enjoy. In fact, we see the game as something in between an episodic game and “games as a service”. New content is added to episodes players have already paid for, and coming episodes will give new interactions with previously encountered characters. When all seven episodes are out, the game will have grown exponentially in terms of quality and content. EM: A number of genres have used fictional groups of people to discuss very real issues of prejudice (for example, Marvel uses mutants to talk about sexuality and racism). In PS, the goblins, elves, orcs, dwarves, and humans live with a history of bias and discrimination; in addressing stereotypes with tact and clear focus, I imagine you have a set of must-do and must-not-do criteria. How do you allow your work to be honest to the degradation and segregation of decades past while allowing that conversation to play a role in reconciliation? PS: It is very important to us to not portray any fantasy race in the game as a 1:1 depiction of any group of people in the physical world. Though of course inspired by the treatment of certain groups throughout history, these are not analogies. Rather than basing their traits or culture on certain groups in our society, we make use of slurs and misconceptions. The orcs may sometimes be believed to be terrorists, but you will also be able to see from their point of view why that notion is absurd. In short, we do not want to perpetuate stereotypes. If you say that your monsters represent a certain minority, you may be reflecting on the way we treat each other – but at the end of the day, they are still monsters. Something other. The whole point of Pendula Swing is that all the races are not so different after all. What sets them apart is nothing but life span and, more importantly, how the world treats them. It’s very hard to break free from stereotypes when even the player, who is not an inhabitant of Pendula, knows that goblins are just stupid, low-level enemies who definitely do not belong in an office. EM: The game feels lived in, a softness to the light that evokes nostalgia. There are porters and ropes connecting stanchions, public halls filled with mirth. Obviously, visual assets do a great deal of the heavy lifting here, so talk about the task of making a city feel inhabited, vibrant, and alive. What is the philosophy behind your art direction, and why do the trees feel so delicate? 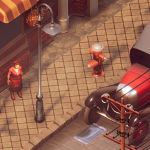 PS: What we are aiming for with Pendula Swing is to convey the general feel of the 1920’s as an era, mixed with the handpainted fantasy aesthetic featured in many of the games we enjoy ourselves. The story plays out during the autumn (a both colorful and sad season, kind of like the 1920’s) and that in turn gave us good direction for the color palette. In terms of modeling, we settled for a low-poly approach to make sure we as a small team could create the variety of assets and touches required to make Duberdon feel like a place where people live. Since the game’s story addresses heavier themes, we felt we needed to strike a balance between making the game inviting and cozy and not stylizing to the point of cartoonishness. Also, the trees are a metaphor for the soul of the protagonist – fragile and withering, yet vibrant and beautiful. Probably? EM: You’re based in Stockholm, Sweden, and I can’t help but notice that Chris Avellone is on your advisory board; how do you see your location playing a role in your work (the local dev culture, support for the arts, etc), and what development tangibles come from work with industry veterans? Do you see indie game culture in Sweden as an expanding field, and what had to fall in place for the project to come together? PS: We’re immensely happy to be working in such an incredible part of the game development industry as the Swedish one. There is an open, supportive, and friendly feeling between companies as well as individuals, and the talent that can be found here is mind-boggling. We have a great mix of tech savvy and skilled artists, which is crucial for success in this industry. The social system also gives a sense of security – we can risk quitting our job to start a new business without fearing that we’ll end up on the street. With the success of companies such as Mojang, DICE and King, the general public is slowly beginning to see and understand what this industry is all about, which is slowly making the climate even better for us. For example, tech investors are now starting to take computer games seriously, which opens up new opportunities that don’t rely on traditional game publishing. EM: Now that you’re putting your work out into the world, things like product support, patches, and game reviews come into the picture; the act of creation can feel liberating in a vacuum, so how has the release of PS changed your routines and work flow as a studio? What wrinkles have popped up when dealing with the public at large? PS: We have received some negative feedback due to the fact that our game is politically charged and not all players agree with our point of view. We have a saying at Valiant, however, which is that for every hater there are two lovers. More concerning is that due to the fact that we are only three people working full time on the game, and we have had to rely on volunteers for testing – whose effort we are incredible thankful for. Not having a tester on staff did mean that some issues did slip though, however, which has affected the experience for some of our players. We have put a lot of effort into listening to their concerns and addressing the most critical issues, prioritizing it over generating new content. Our community have been incredibly patient and helpful, however, and thanks to them the game will continue to get better and better over the coming year. There’s also nothing more inspiring than talking to players who enjoy your game. After release, you can have specific people in mind when working, rather than the faceless “target audience” you’re trying to address before release.